Need to do a quick spray of your windows while covering tons of surface area? Below we have aerosol spray glass cleaner, which is great for covering the entirety of your window in just a second! What's great about these aerosol cleaners is that they won't leave any kind of streak or residue after applying.. just spray and wipe, then step back and admire! 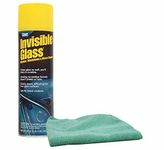 Potent glass cleaner for mirrors, windshields, etc.